This sale is now over. However, the tips I share in this post could apply to any bundle sale. It’s that time of year again! My favourite resource bundle, The Ultimate Homemaking Bundle, is on sale right now and I can’t wait to carve out some time to dig through all the goodies in this bundle. Every year the people behind this bundle do a fantastic job of curating a wonderful collection of resources that encompass so much more than just homemaking. They could easily call this one the Ultimate Life Bundle, and it would be just as accurate. There is something for everyone in this bundle, which is just one of the reasons this bundle is a good investment. the bundle contents are centered around a main theme and the materials inside are curated carefully to fit into subcategories, making it easy to find the ares that interest you most. Bundle sales can feel really overwhelming. I know when I was introduced to them I couldn’t really wrap my head around all that was included. But at their core, bundle sales are a great way to find new resources for things that interest you. Below I’m sharing the steps I take to determine if a bundle sale is worth the investment of my money and my time. The important part about sales like these is to not look at the whole bundle, but rather focus on the areas that interest you the most. When making the decision to buy a bundle I follow the same steps each time. Even bundles, like the Ultimate Homemaking Bundle, that I purchase every year. Here are the steps I tend to follow to get the most of from a bundle sale. The first thing I look at is what bonuses are being offered. If there bonuses that I know I will use, and if the total value of those bonuses is more than the cost of the bundle, chances are I’ll buy the bundle for the bonuses alone. I start with bonuses because often times you won’t be able to get that same discount on a product or service outside the bundle sale. After checking out the bonuses, I move on to my favourite sections. These might be sections that interest me or ones that cover an area I really want to work on improving in. For the Homemaking Bundle I tend to head straight to the Organizing and Systems section! I take a look at what resources are being offered in my favourite sections and make note of the ones that really interest me. If the total value of those resources is more than the price of the bundle, I’ll go ahead and purchase the bundle. I’m not going to be able to get those resources cheaper anywhere else than I will in this bundle. Plus, I’ve only looked at my favourite sections so far. That doesn’t mean I won’t find items in other categories that will be of interest or help to me. I don’t know if you noticed, but there are a number of printable planners in this bundle. You know how much I love printables! The Command Center 101 and 14 Days to Opening Your Front Door to Guests are topping my lists of must reads! 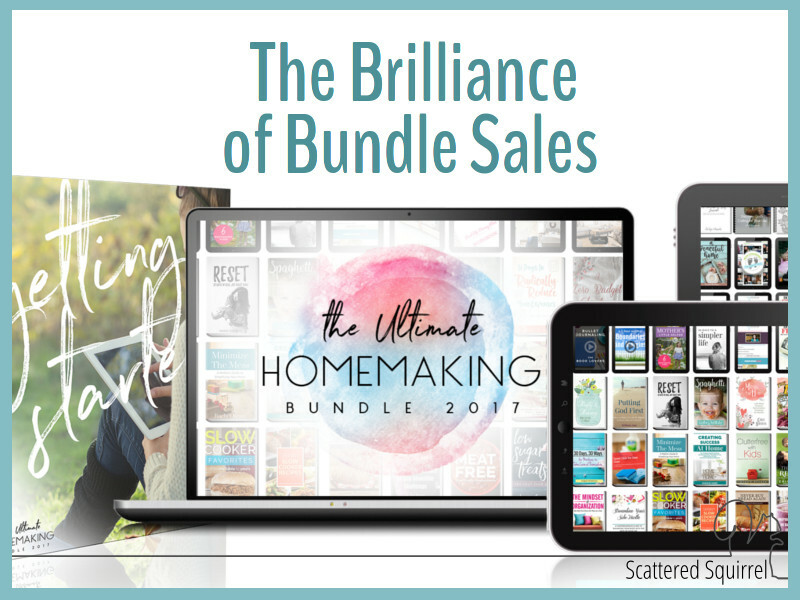 Ultimate Homemaking Bundle, two categories really caught my attention: Creativity and Intentional Living. I’m excited to check out all these resources. Photography and journaling are two hobbies I’m really trying to make more time for, so I was really excited to see what was in this one. In addition to the categories I’ve shown, I’m also taking a closer look at the Recipes, Kitchen, and Finance sections. All the sections have great resources in them. I’m sure over the course of the year I’ll find myself downloading more and more of them. The Ultimate Homemaking Bundle is on sale now through May 1st, 2017. These sales never last for long, so I encourage you to hop over and check it out for yourself. If I’m only going to buy one bundle each year, it’s this one right here. It covers such a wide range of subjects that I know I’m always going to find that I’m getting a fantastic deal on the ones I read and use, even if I don’t use them all. I’d love to hear from you on the subject of bundle sales. Do you like them or could you live without them? Would you like me to share different ones, or just the ones that I personally buy? Drop me a line in the comments below and let me know. I would like to learn more about bundle sales. This is my first time visiting your site so apparently I’m 3 days late on the homemaking bundle but I don’t understand where I’m supposed to go look for bundles? Do I buy them on your website or are they certain places? The few sales I promote each year are usually all through the Ultimate Bundle people. They do such a nice job of putting together the bundles, and I really appreciate how dedicated they are to customer service and satisfaction.